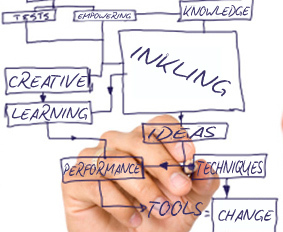 At Inkling training and coaching we’re committed to getting results. We provide the tools and techniques that enable people to get results for themselves, their workplace and their organisation. We help people work more effectively, improve their performance and not only that - we help them to enjoy the journey along the way. At Inkling, we know that people work at their best when they are challenged, involved and can see progression in what they do. We embed this knowledge in our work with individuals, groups and organisations. Happy workers make for better work. That’s why our courses are challenging, highly interactive and a lot of fun. They make you think, they make you realise you can do more and be more. They have a knack of getting to the point and staying there. Very clever. Our coaching is just the same. We help people to understand who they are, to create possibilities of what they want to achieve and finally, to achieve it. We know what its like to work. We know what it’s like to lead. We know what its like to get results. We think you should have that too.